This story has been kicking around for years and has now only been made possible by the release of the Primeval figures. We have been searching for a suitable figure for Celia and when CO released Claudia Brown, we knew that Celia had arrived. This story features the original release of Captain Jack- now superseded by a series 3 version that will be used for future appearances. It also features the debut of the better articulated 9th Doctor. His 'disco dancing' battlepack version appears in the Dalek ship scenes. This story was posted between May and July 2008. It was brought forward to fill the gap when release of the classic figures were delayed. The TARDIS brings the 5th Doctor and Nyssa to a forest in the rain. They head for a spooky mansion at the edge of the forest only to discover they are expected for dinner along with several other bemused time and space travellers. Their host is revealed to be the Master who challenges his guests to escape. Simply that- escape. Frightened and despairing the guests scatter, some through the house, some into the woods where they are hunted by strange creatures. The Doctor discovers that the TARDIS is now just a shell and cannot offer any sanctuary. Dabbling in a new dastardly scheme, the Master has become trapped in his own mind. He has summoned others including the Doctor to help him escape. 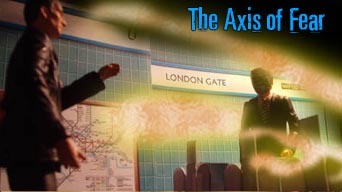 Along with The Unearthed Enemy, Tin Soldiers and Backwards, The Axis of Fear was to have been part of a 6 episode 9th Doctor series back in 2005. In fact it's origins go back much further than that. (See box). The script went through many changes and originally didn't include Jack. There were three men on the train plus Celia. Two of the men were dispatched by Nightshade and his minions while the third man Adam realises that he had an accident on his bike and ended up in a coma. Where in the finished story Celia has flashbacks of being hit by a train, Adam's flashbacks involved a lorry. The TARDIS originally appeared in the story with Rose finding it in the station corridors but when she opens it, it's just a shell. A similar scene in Father's Day probably prompted me to take that out. The Daleks weren't originally supposed to appear. Chasing Nightshade into the tube tunnel, the Doctor encounters what claims to be a future incarnation of himself- brow beaten and defeated. By this time in his life, Rose has been killed. "You can't save them all." He tries to get his former self to give up but ofcourse the Doctor fights on revealing this future self to be an illusion created by the ghosts. Originally it was supposed to be a future version of the 9th Doctor. Had the scene been filmed I would have used the 10th Doctor to give it more credibility. The character of Celia remained cynical and hardnosed to the end. In her last scene she appears to wake up, having fallen asleep eating her lunch in a park. She sees a mother with her baby and laments how her career has forced her to sacrifice a home life. She holds the baby but it has the same monstrous face as Nightshade's creatures. The story nearly went into production in late 2006 when the Dalek ship scenes were shot. However without a supporting cast, it was shelved until early 2008. On 15th March 08 the hospital scenes were shot back to back with pick ups for a future story New Aquisitions. On the 5th/ 6th April the story entered production proper with the scenes on the train, platform and adjacent corridors as well as the ticket office. The last filming day was 3 May with the escalator, additional corridor scenes and the TARDIS interior. Originally, Rose was meant to trap her top in the escalator but when I filmed the scene, it made more sense to have her catch her jeans. Aside from that the story remained largely unchanged during the edit apart from one final twist, cut at the last moment. The dream creatures have chosen the Doctor to take over in Nightshade's place but he asks "What if I refuse?" The frame (right) was cut, mainly because I was unhappy with the ageing on Rose. 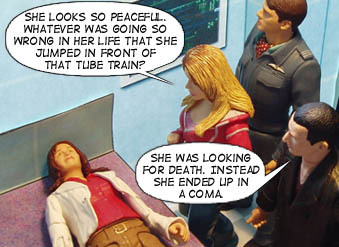 The Doctor counters, highlighting Nightshade's own fear of being trapped here forever before Celia interrupts. The ghosts faces are photos of real clowns doctored in photoshop. The appearance of Captain Jack (especially in his RAF uniform) place this story is between The Doctor Dances and Boomtown but no other continuity is referenced.